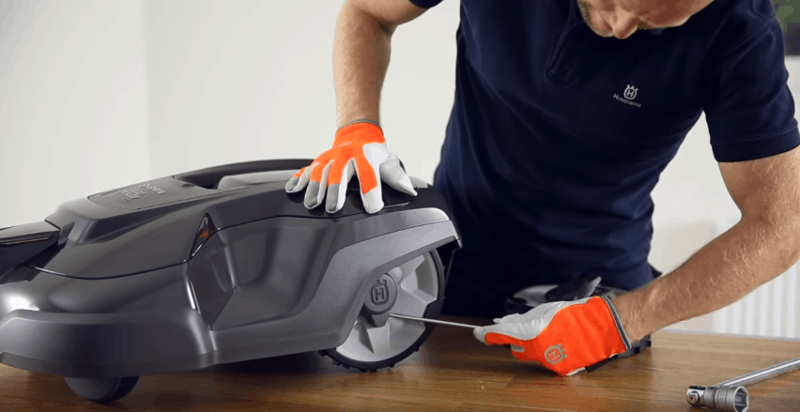 If you have a garden that is more sloped than most and live in an area that’s prone to pretty poor weather then you’ll want to install the terrain kit on your Husqvarna automower. With it you get bigger and more robust wheels which improve the mowers traction, therefore making it more capable of handling tougher slopes, and little attachable brushes which sit underneath the mowers base, these help clean out the wheels of grass during a mow, again making for better traction. The process of attaching the kit is fairly simple to do although it does vary between each model, and is only available for certain models. To make sure you do it correctly I’ve explained the process for all different models below and embedded their corresponding video to make it easier for you to understand. Make sure you’re wearing a pair of protective gloves and have a screwdriver and socket wrench. With the mower sitting on its wheels, use your screwdriver to take off the plastic cover that protects the socket and remove it with your socket wrench. Take off the old wheel and replace it with the new, more robust one. Place the socket back in place and make sure it’s tight using the socket wrench. Repeat these steps with the second wheel. Remove the top cover of the mower, this is a little difficult to explain so it’s best just to watch the video. Now place the top cover back in place, either using the original or new one, and you’re good to go. If you want to get this kit for yourself now that you know how to install it, click here to see the latest Amazon prices. Make sure you’re wearing a pair of protective gloves and have a screwdriver and a socket wrench. Place the mower on its back with something to protect your table (and the mower) sitting underneath it (like a towel). Use your screwdriver to take off the plastic cover that protects the socket and remove it with your socket wrench. Now you can take off the wheel. Place a blot inside the slot of the brushes’ cover and place the cover in the underside of the mower. Screw this in place and then attach the brush. (This is much easier to understand when watching the video). Take the new wheel, fix them in place using the socket wrench and re-attach the cover for the socket. Repeat for the other side and wheel.